It is advisable that you learn synonyms and use them accurately in your writing in order to give an impression that you can use a good range of vocabulary. The diagram shows employment rates among adults in four European countries from 1925 to 1985. The given pie charts represent the proportion of male and female employees in 6 broad categories, dividing into manual and non-manual occupations in Australia, between 2010 and 2015. The chart gives information about consumer expenditures on six products in four countries namely Germany, Italy, Britain and France. The supplied bar graph compares the number of male and female graduates in three developing countries while the table data presents the overall literacy rate in these countries. The bar graph and the table data depict the water consumption in different sectors in five regions. The bar graph enumerates the money spent on different research projects while the column graph demonstrates the fund sources over a decade, commencing from 1981. The line graph delineates the proportion of male and female employees in three different sectors in Australia between 2010 and 2015. Note that, some teachers prefer “The line graph demonstrates…” format instead of “The given line graph demonstrates…”. However, if you write “The given/ provided/ presented….” it would be correct as well. 1. For a single graph use ‘s’ after the verb, like – gives data on, shows/ presents etc. However, if there are multiple graphs, DO NOT use ‘s’ after the verb. 2. If there are multiple graphs and each one presents a different type of data, you can write which graph presents what type of data and use ‘while’ to show a connection. For example -‘The given bar graph shows the amount spent on fast food items in 2009 in the UK while the pie chart presents a comparison of people’s ages who spent more on fast food. Example: The diagram presents information on the percentages of teachers who have expressed their views about different problems they face when dealing with children in three Australian schools from 2001 to 2005. Where = three Australian schools…. In general, the employment opportunities increased till 1970 and then declined throughout the next decade. As is observed, the figures for imprisonment in the five mentioned countries show no overall pattern, rather shows the considerable fluctuations from country to country. Generally speaking, citizens in the USA had a far better life standard than that of remaining countries. Generally speaking, more men were engaged in managerial positions in 1987 than that of women in New York in this year. As an overall trend, the number of crimes reported increased fairly rapidly until the mid-seventies, remained constant for five years and finally, dropped to 20 cases a week after 1982. At a first glance, it is clear that more percentages of native university pupils violated regulations and rules than the foreign students did during this period. At the onset, it is clear that drinking in public and drink driving were the most common reasons for the US citizens to be arrested in 2014. 1. Write introduction and General trend in the same paragraph. Some students prefer to write the ‘General Trend’ in a separate paragraph and many teachers suggest the both to be written in a single paragraph. Unless you have a really good reason to write the general trend in the second paragraph, try to write them both in the first paragraph. However, this is just a suggestion, not a requirement. 2. Your ‘Introduction (general statement + overall trend/ general trend) should have 75 – 80 words. 8. Now, turning to the details…. 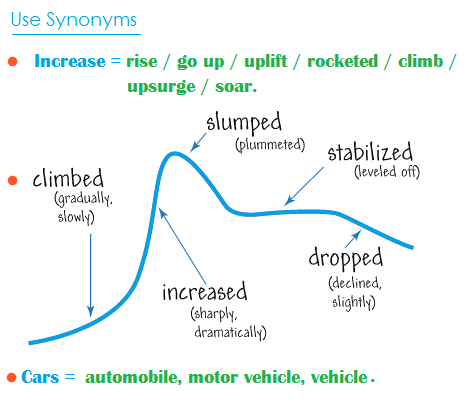 Increase rise / increase / go up / uplift / rocket(ed) / climb / upsurge / soar/ shot up/ improve/ jump/ leap/ move upward/ skyrocket/ soar/ surge. a rise / an increase / an upward trend / a growth / a leap / a jump / an improvement/ a climb. Decrease fall / decrease / decline / plummet / plunge / drop / reduce / collapse / deterioriate/ dip / dive / go down / take a nosedive / slum / slide / go into free-fall. a fall / a decrease / a reduction / a downward trends /a downward tendency / a decline/ a drop / a slide / a collapse / a downfall. 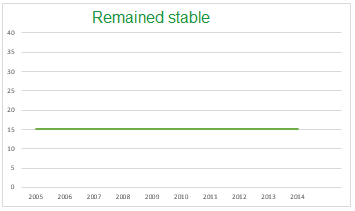 Standability/ Flat level(ed) off / remain(ed) constant / remain(ed) unchanged / remain(ed) stable / prevail(ed) consistency / plateaued / reach(ed) a plateau / stay(ed) uniform /immutable / level(ed) out/ stabilise/ remain(ed) the same. The overall sale of the company increased by 20% at the end of the year. There was a 15% drop in the ratio of student enrollment in this University. 1. Use ‘improve’ / ‘an improvement’ to describe a situation like economic condition or employment status. To denote numbers use other verbs/nouns like increase. The price of the oil moderately increased in last quarter but as a consequence, the price of daily necessity rapidly went up. The price of the goods fluctuated during the first three months in 2017. 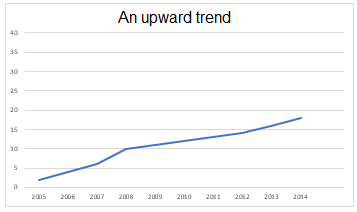 The graph shows the oscillations of the price from 1998 to 2002. The passenger number in this station oscillates throughout the day and in early morning and evening, it remains busy. The number of students in debate clubs fluctuated in different months of the year and rapid ups and downs could be observed in the last three months of this year. » In the 80s, In the 1980s, During the next 6 months, In the mid-70s, Next 10 years, Previous year, Next year, Between 1980 – 1990. Do not incorporate more than 3-4 paragraphs. Do not use a single paragraph to describe everything. The conclusion part is optional. If you think that you have already written more than 170 words and have nothing to say, you can skip the conclusion. The selling volume of the DVD hit a pick with 2 million copies sold in a month but after just three months it reached the bottom with only 20 thousand sold in a month. The number of high-level women executives is well beneath than the number of male executives in this organisation, where approximately 2000 people work in executive levels. The salaries of male executives in three out of four companies were well above than the salaries of female executives in 1998. » When it comes to ….. it/ they …..
cheap » cheaper » cheapest || large » larger » largest || bright » brighter »brightest etc. striking » more striking » most striking || common » more common » most common|| clever » more clever/cleverer » most clever/cleverest etc. 1. The price of the custom made cars was more expensive in 2014 than it is now. »» Use preposition ‘on’ when you talk about times (like morning/ afternoon/ evening/ night) of a day. However, notice the below list that shows a further use of preposition ‘in’ and ‘on’ for periods of the days versus periods. This is often confusing and mistakenly used by IELTS candidates. Look at those, notice the use and memorise it. »» Use preposition ‘at’ when you talk about weekends, holiday periods, or the night time. Few more informal expressions with their formal versions are given below. Since IELTS is a formal test, your writing should be formal as well. Using informal words or expressions should be avoided. Some of the informal words are so frequently used that it would be tough for you to eliminate them from your writing. However, we would suggest you make a habit of using formal words and expressions instead- for your performance and band score’s sake. An increase: Between the noon and evening, there was an increase in the temperature of the coast area and this was probably because of the availability of the sunlight at that time. 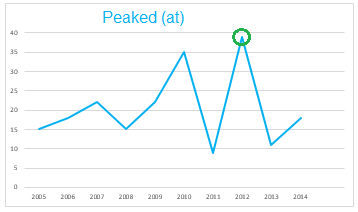 A/ The peak: The number of visitors reached the peak in 2008 and it exceeded 2 million. A fall: There was a fall in the price of the energy bulbs in 2010 which was less than $5. A decrease: After the initial four years, the company’s share price increased and there was a decrease in the loss it was bearing. 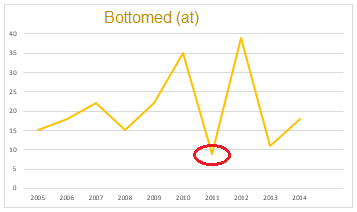 » Boomed (to) A boom / a dramatic increase. 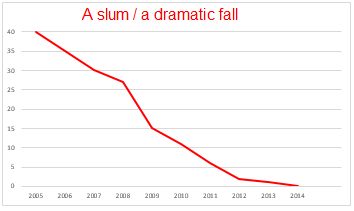 » Slumped (to) A slum / a dramatic fall. Use ‘adjective/adverb’ to indicate the movement of a trend. 1. There has been a slight increase in the unemployment rate in 1979 at which point it stood at 12%. 2. The price of gold dropped rapidly for the next three years. Use ‘adjective’ to modify the ‘Noun’ form of a trend and use ‘adverb’ to modify the ‘verb’ form of a trend. 1. The number of male doctors in this city was greater than the number of female doctors. 2. The number of European programmers who attended the seminar was fewer than the number of Asian programmers. 3. The percentage of male doctors in this city was higher than the percentage of female doctors. 4. During 2010, the inflow of illegal immigrants was lower than that of 2012. 5. the birth rate in Japan in 2014 was higher than the birth rate in 2015. Vocabulary to compare to what extent / to (/by) what degree something is greater/higher than the other. » Overwhelmingly, Substantially, Significantly. Considerably. » Hardly, Barely, Slightly, Fractionally, Marginally. » Subsequently, Respectively, Consecutively, Sequentially. » Previous, Next, First, Second, Third, Finally, Former, Latter. Note: You do not need to use ‘consecutively/ sequentially/ respectively’ if there are only two values to write. 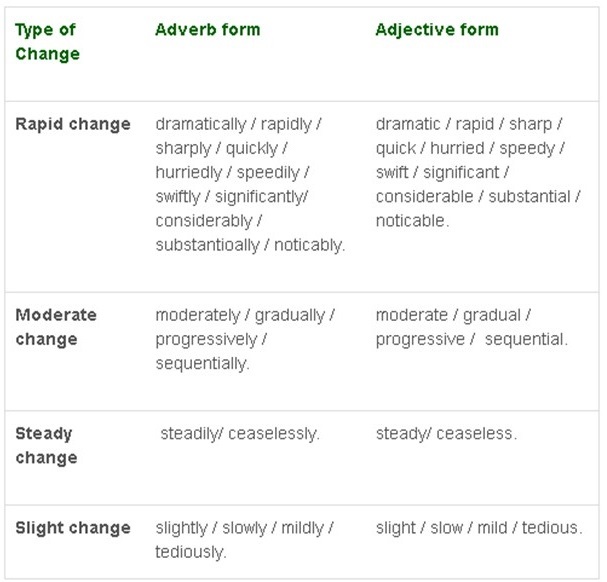 You will often need to use ‘adjectives’ and ‘adverbs’ to indicate the speed of changes in the trend (called ‘Degree of Speed) in your answer. Following is a list of vocabularies that will help you present the quick changes quite effectively. » Rapid, Quick, Sharp, Swift, Sudden, Wild. » Rapidly, Quickly, Sharply, Swiftly, Suddenly, Wildly. 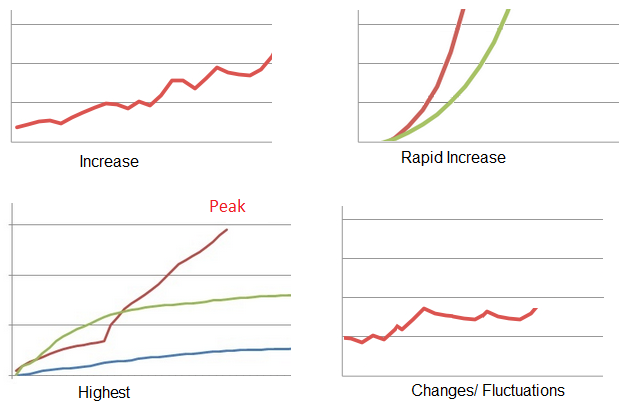 A different set of vocabulary to represent the ‘Degree of Trend’ would also be handy to summarise data presented in a graph. Both ‘adjective’ and ‘adverb’ form of this vocabulary list is given below. Use ‘adjectives’ to modify a ‘Noun’, while ‘adverbs’ should be used to modify a ‘verb’. » Significant, Huge, Enormous, Steep, Substantial, Considerable, Marked, Dramatic, Abrupt. » Significantly, Hugely, Enormously, Steeply, Substantially, Considerably, Markedly, Dramatically, Abruptly. » Under, Over, Inside, Beside, On top of, Adjacent, Opposite, Next to. » Along, Through, As far as. » Midpoint, Halfway, In the middle. » Parallel to, Parallel, Perpendicular to. » In front of the, Behind the. » To the right, To the left. » On the right-hand side, On the left-hand side. » North, South, East, West. » Northern, Southern, Eastern, Western. » In which, To which, From which. » Changed to/ Converted/ Gave way to/ Became. The diagram/ picture/ flow chart depicts/ illustrates/ describes the proces of/ how…. A) The cycle/ process then repeat itself. B) The cycle/ process is then repeated. It is predicted/ estimated/ projected/ forecasted/ expected/ anticipated that……… will ……….. It gives prediction/ estimation/ projection/ forecast of ………. ……. Will have ……. by ……. (year/month/decade)……. However, to compare/contrast data or to show a significant change/trend you will need to show a figure that you will use as the base. For example, The British spent over eighty thousand Pounds on average which was twice than the spending of Americans and approximately quadruple than that of Irish. Here, over 80 thousand pounds is the base figure. Is/ was/ were: The percentage of foreign students was exactly ten in 2001 in this university and it rose three times in ten years. Stand at/ Stood at: The percentages of males and females who opined that they should be allowed to get married at 21 stood at 14 and 16 in 1990 but witnessed a noticeable decline in 2010. Exactly & As high as: The sale in March was exactly 400 and went up as high as 1100 in June. Using (): In summer, the number of refrigerators sold (154) was far greater than the refrigerators sold (63) in winter. 1. From January to March the death case rose three times which was only 23 between October and December. 2. The temperature, which was 21 degrees C in March, climbed to 39 degrees C in mid-July. 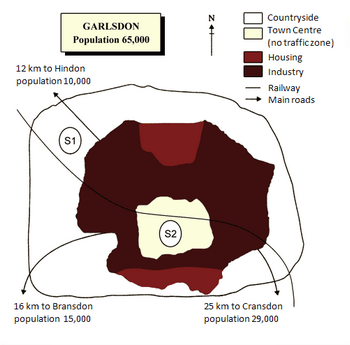 Makes up: In the first decade, the population remained steady, which made up 2.8 million approximately, but it doubled in the next 30 years. 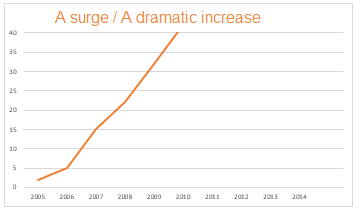 Constitutes: The initial expenditure, which constituted 280 USD, climbed rapidly and reached the peak during 2014. 1. In June 2016. the number of Asian students enrolment in this university accounted for 45 which is estimated to be almost double in the next year. 2. The number of infected people, which accounts for nine, is markedly lower than the number of infected patients in the last month, which accounted for forty. From the graphs, it is quite evident that. 1. In conclusion, third world countries have improved their production sectors like garments, over the last 10 years whereas the first world countries have improved their technology and research sectors during the same period. 2. In brief, the overall sale of the company has improved in the last 5 years except 2005 when the sale reduced significantly due to retrenchment. 3. All in all, the process of building an IC is a complex one and involves more than eight steps to complete including the testing phase. 4. It is quite evident that the women employment progressed remarkably in the last decade and in some employment sectors women are well ahead of men. 5. To conclude, weather forecasting is a complex process and a great deal of technology is used to prepare and broadcast the reliable weather forecasting. Tip: ‘In a nutshell‘ is not a formal expression and this is why you should not use it in your IELTS Writing. Everybody uses some common vocabularies to describe a diagram and to write a report. 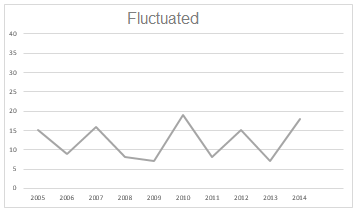 For instance, there would be hardly anyone who does not use the words ‘increase, decrease, fall, higher, fluctuate, climb, decline, quickly increase, sharply decrease, and those are really obvious words used by most of the IETLS candidates. If you too use these overused words and phrases, you would not be able to give an impression that your range of vocabulary is stronger and richer than others. 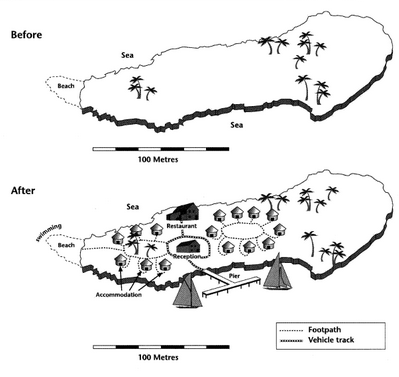 » As the diagrams suggest: can replace – “As can be seen, According to the diagrams. » Skyrocketed: can replace – ” very quickly increased. » Commence: can replace – “start”. » Correct: can replace – “right”. » Declivity: can replace – “drop, fall, decrease”. » A steep fall: can replace – “A quick fall”. 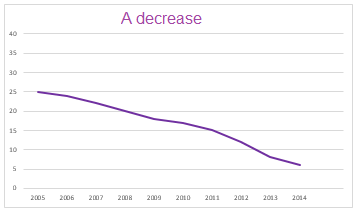 Example: Employers’ contribution to the fee for skill development courses has plunged to a great extent in the last decade, as the graph suggests.